The British pound was the weakest major currency yesterday on the back of reports that there was no agreement on a customs union between Labour and Conservatives. No surprises there then. It fell further this morning in reaction to the latest consumer inflation data. However, the losses have so far been contained in what has been a very quiet week in FX markets. We wouldn't be surprised if sterling were to recover from here, given how resilient it has been despite everything that has been thrown at it over the past several months. According to the ONS, the UK Consumer Price Index (CPI) stood at +1.9% year-over-year in March, unchanged from the previous month, while core CPI was also steady at +1.8%. Both were slightly below forecasts, as too were other measures of inflation including Retail Price Index (+2.4% y/y), Producer Price Index input (-0.2% m/m) and House Price Index (+0.6% y/y). The GBP/USD came to within 30 pips of the 1.30 handle in reaction to the date before bouncing back slightly, with other pound crosses also coming off their worst levels. Among the pound crosses, the GBP/JPY is one which we expect to rise given the current "risk-on" market conditions with US equity markets being near their previous all-time highs and indices elsewhere also sharply higher year-to-date. The safe-haven yen has been among the weakest major currencies as a result. Thus, if the pound has any chance of a comeback amidst ongoing Brexit uncertainty, its best bet would be against the yen given the current positive market conditions. Technically, the GBP/JPY has been printing higher lows ever since bottoming out at just below the 132 handle earlier this year. 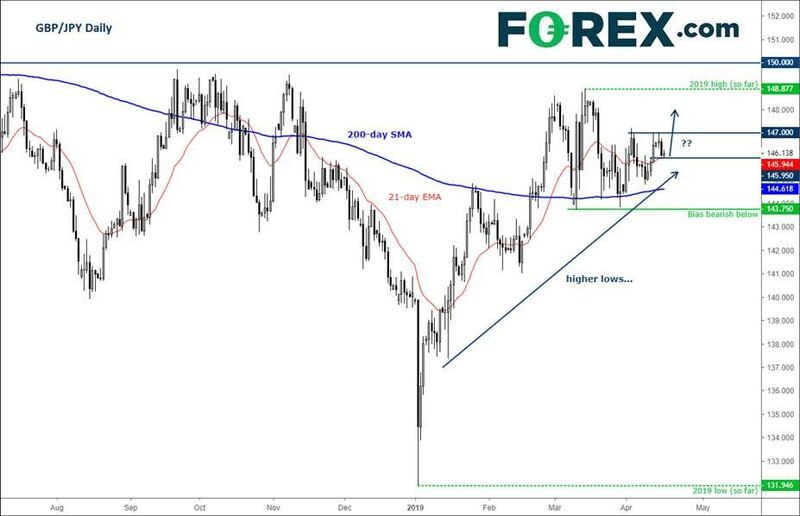 At the time of writing, it was testing potential support around 145.95 area, where the 21-day exponential moving average met an old resistance level. We wouldn't be surprised if rates bounced here initially towards last week's high at 147.00 ahead of last month's highs circa 148.80/90 area next. However, should the Guppy break below the most recent lows near 143.75 area, then in that case, we would drop our technical bullish bias on this pair.